The Popular Art Centre's Dance School offers on an annual basis a set of dance courses in the field of popular, creative and modern dancing, such as Palestinian Dabke, Ballet, Salsa, contemporary and Afro-Dabkeh. The courses are for children aged from 5-16 years, in addition to teenagers and adults from both genders who desire to learn the principles and techniques of these performing arts. The dance school also organizes specialized training workshops for dancers and dabke trainers on different aspects - under the supervision of professional local and international trainers. The dance school has also helped to establish dabke groups in less-privileged areas of the West Bank. The Popular Art Centre is the first centre that started organizing dance courses(folkloric, and international dance types) in Palestine. Training courses are held at PAC's headquarter in Al-Bireh City. 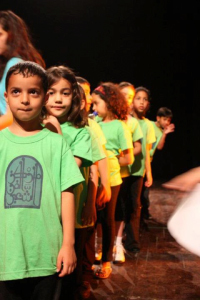 The Dabkeh School targets students between ages 5 – 16 years old. It is a one year program (September - June). Students attend a 45 minutes class twice a week. Currently, the school has nearly 480 children divided into 24 groups. Registration for the Dabkeh School for Children open in mid-July.